Last week I discussed Journaling Supplies, detailing various types of notebooks and pens available in the marketplace. And I suggested you experiment with several different styles to determine which one(s) work best for your writing temperament. But I know there are times when electronic journaling is preferred. This will be the focus of today’s post. Privacy is a real concern when it comes to journaling. If we fear others viewing our most intimate thoughts, we are less likely to write. And quite frankly, it is this vulnerability through writing that helps bring about wholeness and well-being. When writing by hand, it is important to store your notebooks where privacy will be respected. When journaling on your computer, privacy is just as important. Online Journals: Penzu is a website I have used these past couple of years with great success. I find the interface user-friendly and easy to navigate. There is a free version, which allows you to create one journal with limited customization… or a pro version which allows you to create multiple journals with full customization features. For $19.99/year, I think the Pro version is worth the price. What I LOVE about Penzu is the security feature. You create an account with one password – and then have the option to create a separate password for each journal. That is double-protection, which provides peace of mind. A simple google search will yield more online Journal options, but since I have only used Penzu (I’ve seen no reason to change…) I will not attempt to provide an exhaustive review. DayOne is considered the premier journaling app, earning the 2012 App of the Year and the 2014 Apple Design Award. When I purchased my Macbook in 2011, this was the first app I downloaded. Again, it is password protected, and the interface allows text as well as images. The app syncs across all Apple devices, allowing me to journal anytime – anywhere. While the app only provides one journal, there is the ability to tag entries for easy reference. And, for those who may wonder what to journal… there is a daily prompt option. If you already use EverNote as a productivity app, the interface is a natural fit for journaling. I know several who successfully use this method for their journaling practice. If you are comfortable with EverNote, there is no reason to learn another program. When to use computer vs handwriting? Obviously this is a personal preference. However… I find when my mind is spinning, and I need to do a brain dump, the computer is the better option. My keyboarding skills allow my fingers to keep up with my thoughts, and I do not have to worry about hand-cramps. It is for this reason I use the website 750words to do my Morning Pages, rather than Julia Cameron’s suggestion of writing three pages long-hand. When I am noodling a problem, however, or reminiscing about the past, I prefer to handwrite. This forces me to slow down my thoughts, which often results in the discovery of a hidden insight or personal epiphany. In addition, the kinesthetic movement of the hand across the page, coupled with the artistic formation of letters, stimulates the right-side of the brain: the creative side. This allows me to view the problem from multiple points of view and think outside-the-box. I tend to journal more long-hand these days, but honestly… it doesn’t matter which method you choose. 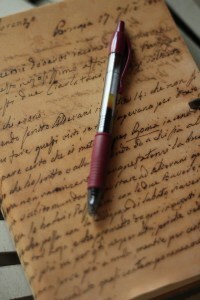 As long as you write real, journaling is beneficial to physical, mental, and spiritual health. I love the statement, “Write real.” That ought to be a bumper sticker ! Interestingly, when I do my morning pages, I can easily write 650 words in 15 minutes. Boom. I’m done. Yet, when I am working on my novel, my production drops to 250 words in an hour! I can relate, Cathy! I have no problem writing my thoughts… it’s when I try to craft story that my brain freezes. Hello Molly 🙂 Great points! I was wondering if you ever thought about creating a personalized font from your own handwriting? I’m sure it could turn into another one of those things that can send on off on a rabbit trail, on issues ‘about’ writing, versus actually, er, writing. However, I’m pretty sure there is a program, something, that would enable you to create a personalized font, and I just think it would be super cool to type, in your own handwriting, and something someone’s kids may appreciate as well. I briefly looked into this a few years ago with regards to scrapbooking. I always teach to handwrite the story behind the photo, but know some cringe at the thought. This kind of program seems to be a good compromise. Thanks for the idea… I will check into it later this week.